Our investment in green infrastructure is an investment in the District’s future. On January 14, 2016, DC Water, in conjunction with the United States Environmental Protection Agency, United States Department of Justice and the District of Columbia executed a modification to the 2005 Long Term Control Plan (LTCP) Consent Decree to include innovative GI practices to achieve the reduction of combined sewer overflow volume by 96 percent system-wide (for the Anacostia and Potomac rivers and Rock Creek) and offer additional community benefits. 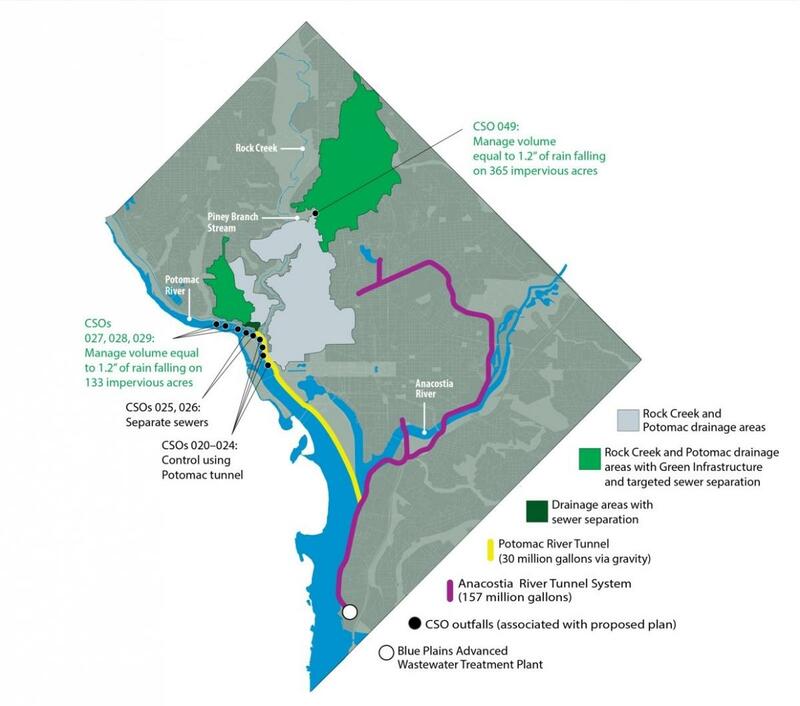 Under the modified agreement, DC Water will eliminate the previously-planned underground tunnel for Rock Creek and will instead build GI and targeted sewer separation to manage the volume of runoff produced by 1.2" of rain falling on 365 impervious acres of land that currently does not absorb stormwater. This portion of work will be completed by 2030. For the Potomac River, DC Water will build an underground tunnel capable of holding 30 million gallons of combined stormwater and sewage. The tunnel will use gravity to allow the collected combined sewage flow to DC Water's Advanced Wastewater Treatment Plant at Blue Plains and will be completed by 2030. In addition, DC Water will construct GI and targeted sewer separation to manage the volume of runoff produced by 1.2" of rain falling on 133 impervious acres of land that currently does not absorb water. The GI in this area will be in place by 2027 and sewer separation will be completed by 2023. 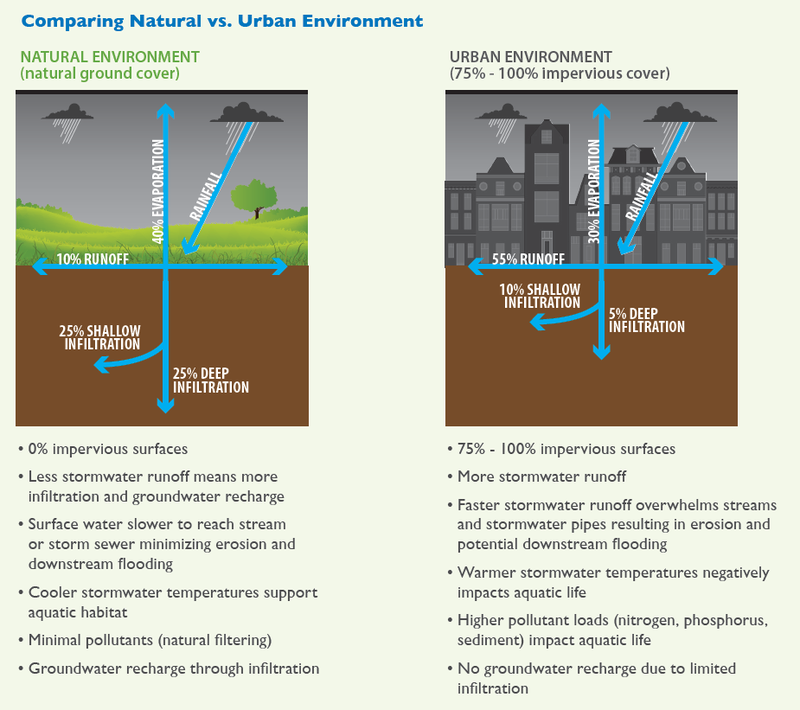 GI is an approach to managing stormwater runoff that takes advantage of natural processes such as infiltration and evapotranspiration, to slow down, clean and in some cases reuse stormwater to keep it from overwhelming sewer systems and polluting waterways. The goal of GI is to mimic the natural environment through the use of plants, trees and other measures. See the figure below to see how these processes work. 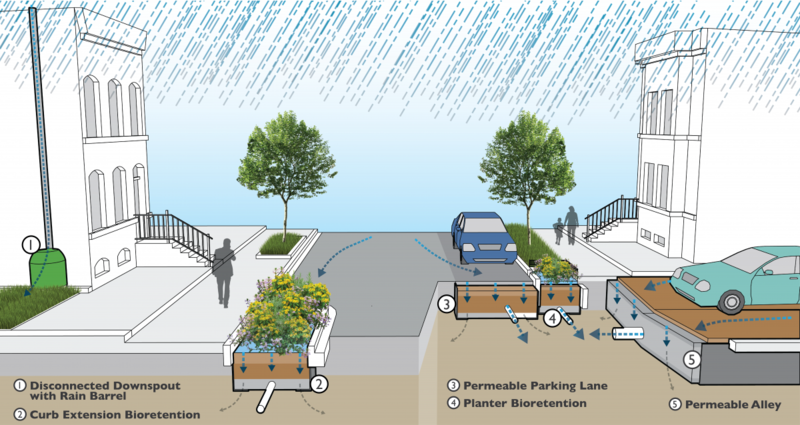 In addition to the control of stormwater, GI technologies like, permeable pavement and bioretention provide other benefits to the community. Sooner. GI provides water quality benefits as soon as installation begins. The GI and other improvements will allow the District to enjoy water quality and environmental and social benefits as early as 2017. Better. GI offers environmental, social, and economic benefits that would not be realized under the previous plan. GI can increase property values, beautify neighborhoods, cool extreme summer temperatures, support natural habitats, enhance public space and support local green jobs. Stronger. DC Water's schedule for GI implementation and construction of the redesigned Potomac River Tunnel helps reduce the impact of construction on neighborhoods and allows sufficient time for required construction approvals. The revised schedule allows for an additional five years to complete portions of the project. This additional time will help protect our ratepayers responsible for financing the $2.6 billion project. Jobs. DC Water has establish an ambitious local jobs program that includes training and certification opportunities for District residents interested in GI construction, inspection and maintenance jobs. The National Green Infrastructure Certification Program (NGICP.org) has trained and certified the first group of individuals. DC Water has established a goal to have 51% of new jobs created by the GI project to be filled by District residents. DC Water has also engaged professional service firms and contractors based in the District to perform work associated with GI. What Can You Do to Help Clean Our Rivers? Stormwater is the water generated by rain or melted snow on "impervious surfaces" or surfaces that do not allow the water to soak into the ground (such as roads, driveways, sidewalks, parking lots, and buildings). Stormwater runoff occurs when rain or snowmelt flows over these impervious surfaces. Stormwater can pick up trash, excess nutrients (such as nitrogen and phosphorus), sediment and other pollutants that flow into a storm sewer system or directly to a lake, stream, river, or wetland. Untreated stormwater runoff ends up in the waterbodies we use for swimming, fishing and providing drinking water. Polluted stormwater runoff can have many adverse effects on plants, fish, animals and people. For example, trash can clog waterbodies, nutrients can cause algae blooms, and sediment impacts aquatic life. In a combined sewer system, stormwater can cause combined sewer overflows.